If your web application includes Java code from a previous project or has been partially developed in another IDE, you can paste your Java code and folder structure into iiziGo after creating a new iizi Quickstart project. During deployment for distribution, all directories and libraries are packed into your iiziApp. Having started with Quickstart, a main Java class is created for you in the src package. This has been named with your iizi project’s name, and contains the minimal iizi Annotations necessary for integrating your Java code into your iiziApp; you can connect your Java project through this class. At present – version 1.0 – only one Java class can serve as the annotated entry point for a VirtualSpace or a UI Panel. All references to iizi elements are made using a reference path name in the following format: “module:/path/name”. Java code is updated and changed using Eclipse refactoring mechanisms whenever required. 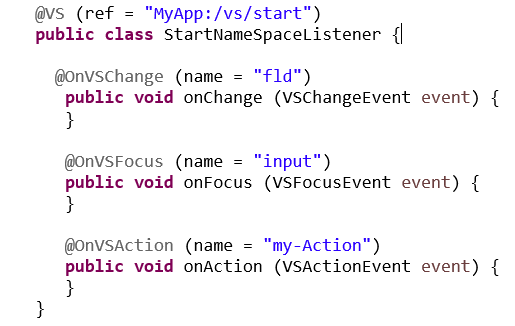 Your Java classes can be annotated to a VirtualSpace directly while your Java methods will have annotations to VirtualSpace entities. In the iizi Platform you do not normally add the ‘listeners’ that are common in UI programming; instead, you connect a method to the place requiring the specific functionality.